Troubled Mystic is a deck of musical cards, each one its own kind of cool. Overall the tone cleaves closely to an EDM/downtempo motif. You’ll hear distinct elements of house music, jazz-infused drum licks, a touch of glitch, and club-worthy drops. 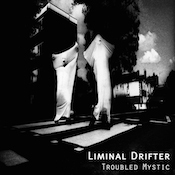 Right from the opener, “A Love Song for Ghosts,” Liminal Drifter (aka Dr. Simon Order) grabs the listener by managing to mix a jangly sound like a Japanese biwa with a little bit of spy-movie vibe and making it sound like it all belongs there. The mix of styles shows when “Subway Dream” follows with a watery burble and soft, cool edges. This one gets deeper and more intense as it goes along, the sound thickening up with a wide variety of elements. “Verterons Ambo Flow Cut” introduces some electronic minimalism, loops of repeating phrases interspersed with sequencer. Its slowly shifting, just-enough-movement dynamic works in its favor. Hypnotic and yet able to hold your direct interest. “Japanese Devotion” is a bit of playful weirdness. Boppy notes bounce along, accented with reverse-echo phrases that put me in mind of the 80s band New Musik. (Yes, I may be very much alone in that reference.) Speaking of the past, “Adventures Beyond the Body” will pique your old IDM memory banks. Field recordings and dubbed-up vocal snips are the canvas for a melody that plays out in metallic-spring tones and shiny sequencer runs. Irresistible stuff. Throughout the album you’ll enjoy an extra dose of mellow courtesy of dreampop vocalist Chloë March. Her smoked-satin voice slides and glides through the club-ready “Heartbeat of Your Soul.” Order wraps her voice in light, effective echoes and puts drops in spots where the last element you get is her voice fading. She sing-talks her way through the title track and pulls up welcome thoughts of Moorcheeba. Again, Order pulls spots and phrases out of the main vocals and uses them the spice the background. There have been times, in my several listens, when I become too aware of the looping/repeating motif that forms the basis for much of the work here. Why it occurs to me sometimes but not every time is a mystery to me. All I can suggest is that sometimes I’m drawn more into the smooth hypnotic lull, which is the point after all. It certainly hasn’t kept me from digging on this release every time I’ve listened. It’s varied enough to hold my interest and certainly doesn’t lack for cool. The production work is also excellent; the sound is full and in constant motion, with plenty of small detail work to keep your head happily busy. Get this, get cool.